People in Ann Arbor, Michigan are about to experience home food delivery without a driver. Domino’s Pizza and Ford have paired up in a pilot project which will look at how humans interact with driverless food delivery cars. Ann Arbor is home to thousands of students, an age group which will not likely find this new technology a hindrance. However, this could turn into a very interesting social experiment for the food industry. Customers ordering through Domino’s will be able to track their delivery in real time by using a downloadable app on their smart phones. They’ll receive an SMS, giving them a 4-digit code they will need to use once the car arrives. It’s the last 50 feet of the delivery experience that will provide unpredictable results for Domino’s. The driverless delivery car may end up in the driveway, or near the curb. Customers may not want to go out to the car if it is raining or snowing. Human behavior can be difficult to predict at the best of times, and especially when dealing with food. This will be the first time a food service or retail company has used driverless cars to interact with actual consumers. This experience will undoubtedly offer convenience for customers in a variety of ways. With this app, expectations will be managed, and service quality – Domino’s key strategic focus – will be more consistent. This is because delivery times will be streamlined, fewer pizzas will be damaged in handling mishaps, and the customer won’t have to deal with tips – at least not for now. No tipping will reduce price points, making delivered pizzas more affordable. For cash-strapped students, this is key. For Domino’s, the business case for a driverless fleet is unquestionably strong. Lower insurance costs, lower fuel consumption, consistent delivery times, no thefts, controllable temperatures to keep food safe for customers – and therefore, less waste – the list goes on. Domino’s delivers more than one billion pizzas annually, and has over 100,000 drivers. Running a driverless fleet could save the company millions. 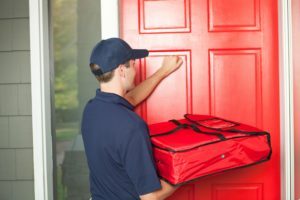 Embracing the concept of home food deliveries without having to hire drivers cannot come soon enough for the food service industry, which is looking for ways to increase revenue beyond their regular foot traffic. Restaurant operators won’t need to deal with the headache of hiring the right people for delivery, and delivery is an important means of expanding the brand outside their facilities. Most of us who have ordered home-delivered food have had mixed experiences. Some drivers make convicted felons look like angels, and would make some customers wonder where the food is really coming from. But home delivery is no walk in the park for the drivers, either. A recent survey in the U.S. suggests drivers often find themselves in unbelievably awkward situations, including being tipped with weed, being asked to eat with the customer to offer company, showing up during a domestic violence situation, being greeted by a naked customer as the front door opens. There is an endless list of unpleasant scenarios which would discourage anyone from contemplating home food delivery as a full-time job or even part-time job. A humanless home food delivery experience does offer a unique perspective on the market currency of convenience. For years, price has been king. In study after study, price has trumped any other feature consumers were looking for in food service. However, younger generations have a different take on convenience. Price remains a significant factor for higher revenues of course, but the constant quest for more convenience on both sides of the food continuum is now reaching the point of obsession. Getting rid of delivery personnel is now a realistic approach. With driverless home food delivery, one could potentially get food delivered without seeing a single human being – a frightening thought. In the future, consumers could binge on their favourite junk food several times a week, without the embarrassment of seeing the same delivery person.